A North County craft beer festival is coming to San Diego this September! More than thirty craft brewers will unite in Holiday Park on Saturday, September 10, from 12-4:30pm for this year’s third annual Carlsbad Brewfest, a day of unlimited beer samples hosted by the Carlsbad Hi-Noon Rotary Club. We are raffling off 2 tickets to this event, as well as offering promo code SDVILLE for $5 savings per ticket. Read on and be sure to enter! New Belgium Brewing has signed on as the major sponsor of the Carlsbad Brewfest for the third year in a row, joining a stellar lineup of participating craft breweries that include Ballast Point, Belching Beaver, Bell's Brewery, Stumblefoot, Fall Brewing, Figueroa Mountain, Firestone Walker, Latitude 33, Booze Brothers, Barrel Harbor, Alpine Beer Company, Guadalupe Valley, Ironfire, Pure Project, Iron Fist, Karl Strauss, The Lost Abbey, Mike Hess, Modern Times, Green Flash Brewery, Coronado Brewing Company, Langunitas Brewing Co., Duck Foot and more. There will also be live music and games to complement the fun offered by brewers’ booths, and local restaurants will bring their best food items for purchase. More than 1000 attended last year’s Brewfest. 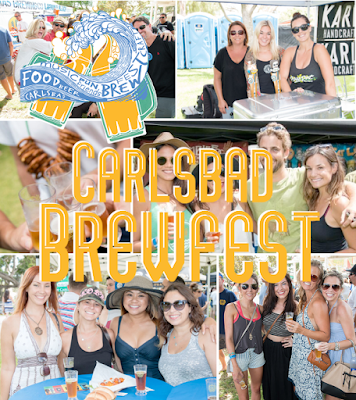 Tickets to the Carlsbad Brewfest are available online for $50 and include unlimited samples of nearly 70 beer varieties and a taster cup. Promo code SDVILLE saves $5 per ticket. There are also a limited number of $10 designated driver passes. Proceeds benefit North County teens and Marines through scholarships to help further their educations, as well as other Rotary Club charities. Carlsbad Brewfest takes place at Holiday Park - located at 3400 Pio Pico Drive and Chestnut Avenue just off the I-5 Freeway at the Carlsbad Village Drive exit. Parking will be available in the area as well as plenty of places to lock up a bicylcle. For more information, visit carlsbadbrewfest.org.